Yep. You guessed it. The incontinence is back and it’s back with a vengeance. I was getting a little nervous that there might actually be something serious wrong with her until I found some of her medicine “hidden” around the house. Now I have to watch her eat it to be sure she isn’t stashing it around the house. This entry was posted in Uncategorized and tagged incontinence on August 29, 2014 by Kizzy T. Grace. 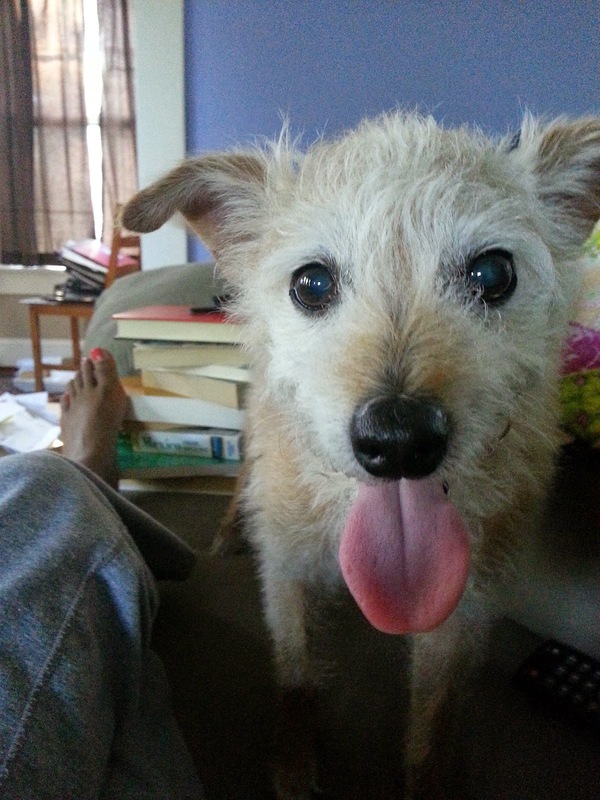 Since Matilda has Addison’s Disease and incontinence, she takes medicine twice a day, every day. She picks around the pills if I put them in her food, but she takes it willingly if I put it in a snack. I had been giving her the pill pockets made my Greenies, but they are $9.00 per bag and she goes through a bag in less than a month. Once I decided to look for a cheaper alternative, I started putting them in cheese. She loved that, but I think the cheese was starting to give her stomach some issues. 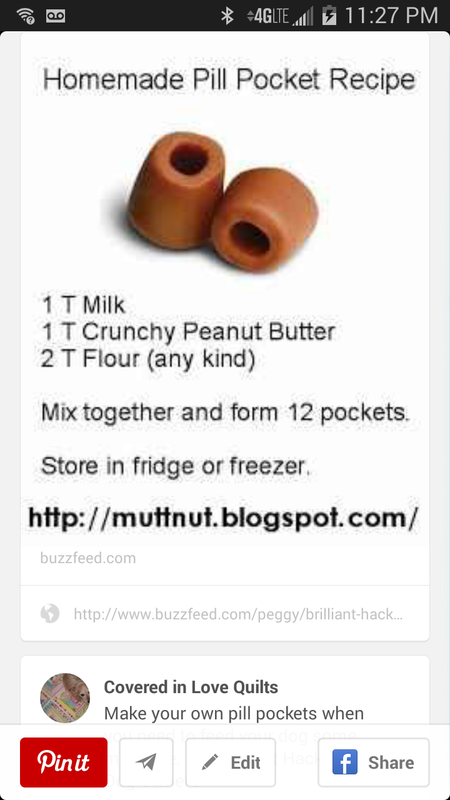 By chance, I came across this recipe on Pintrest. I was having a lazy afternoon, so I decided to try it. I didn’t have crunchy peanut butter, so I used the regular peanut butter I had on hand. Mine didn’t come out as pretty as the picture, but it was the exactly right consistency to neatly hid a pill. Matilda was hesitant at first, but she ate it and now she looks forward to getting her medicinal treat. For the past couple of days, I’ve been finding little bugs on Tildy. I’ve decided that they are fleas and I’m not happy about it. This is the second year in a row that Frontline Plus has failed me in the month of August. It might be time to reassess. Since it is too soon to do another application of Frontline, I again turned to Pintrest for help. There, I found this DIY flea shampoo. While I didn’t see bugs floating in the water when I was done, as the recipe said that I would, I also didn’t find any bugs on Tildy when I was done. The flea dirt was gone too. Pintrest to the rescue once again. 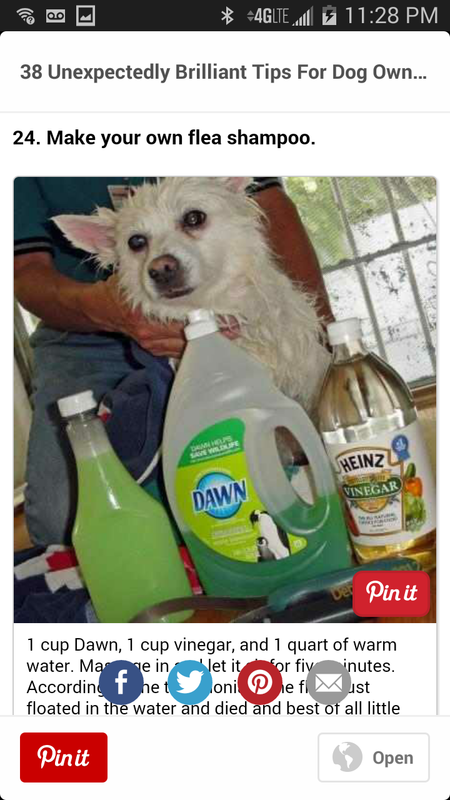 Both of these ideas came from a list called 38 Unexpectedly Brilliant Tips For Dog. Owners. 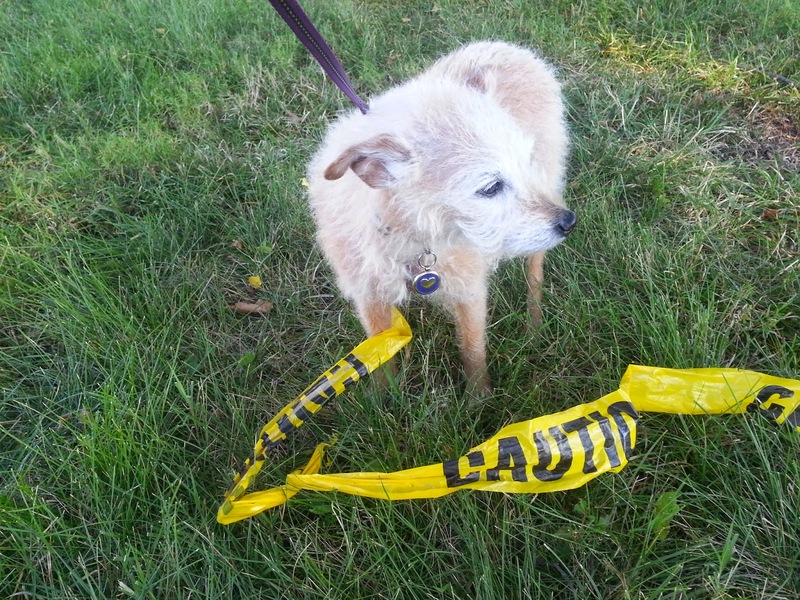 This entry was posted in Uncategorized and tagged Addison's Disease, cheese, fleas, Frontline Plus, homemade, incontinence, peanut butter, pill pockets, Pintrest, shampoo on August 12, 2014 by Kizzy T. Grace.